Welcome to Star-Surf! We are the premier surf school located in Santa Monica California, giving surf lessons year round to the Los Angeles basin. We currently provide lessons to over 70 hotels in southern California. Some of our clientele are from such companies as Redbull, Nike, and Disney. Star-Surf has been providing consistent superior service for years, and our lead instructor has over 30 years experience in the water. He has even been a part of teaching a surfing class at Santa Monica College (smc.edu). So if you are ready to have the experience of a lifetime and want to take a surf lesson, allow us the privilege guiding you on your journey into the water. We can teach any individual regardless of age or experience. Your surf lessons will be tailored to you and your comfort level. We will provide you with a soft foam surfboard for your safety and a wetsuit if needed. When you go out into the water to surf, you will have the advantage of having one of our highly trained instructors that will be using Star-Surf's proven methods to ensure you stand up and surf all the way to the sand on your first lesson. Our dedicated and enthusiastic instructors take pride in teaching the art of surfing and want to make sure you have the experience of a lifetime while visiting us. Besides teaching private lessons, Star-Surf has started up a new group this year. This is for those of you who want to pinch pennies and want to a take a group lesson, but do not have a group. Star-Surf is introducing Weekend Warriors, a weekly event where you can join in a group and meet others who are learning how to surf. Every Saturday and Sunday at high noon we will help you in selecting a group of your skill level and take your surfing to new heights. Of course, if you have your own group and wish be alone, that option is always available as well. 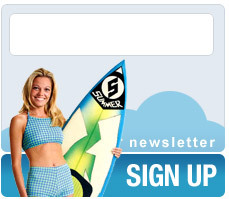 Star-Surf is here to meet all your surfing needs. So give us a call and let us guide your surfing to the next level. © Star-Surf.com 2009. All rights reserved.